The Ashton Classic Churchill is tagged with free shipping. If you order this product, your entire order will receive FREE BCP Ship Saver shipping! Famous for smooth taste and unerring consistency, Ashton Classic cigars are crafted using a seamless blend of 3-4 year old Dominican fillers blanketed in a light Connecticut shade wrapper. The medium-bodied, fan-favorite Ashton Classic line is available in a wide range of sizes, making it not only supremely delicious, but easily accessible as well. Ashton Classic Churchill is a pleasantly mellow smoke, offering tasting notes of cedar, cream, subtle vanilla, and almond in a 7 1/2 x 52 Churchill vitola. 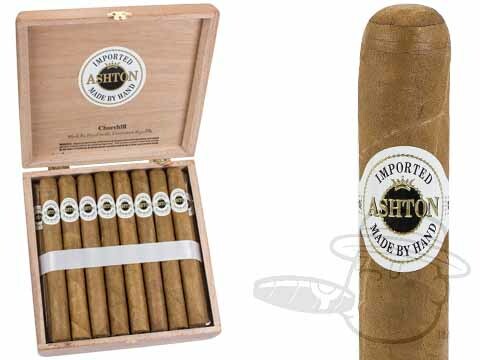 Enjoy the greatest value on Ashton Classic Churchill with this special 2-Box Deal! One of my favorites that I save for special occasions...great from start to finish! Save this one for when you have the time to sit back and savor the moment! Purchased this July and these sticks are near perfect! Great shade wrapper, and aroma...I've purchased Churchills many times to find that the burn is ofter uneven due to the inconsistent bunching and rolling. But these are great! I may be a little biased because I smoke Ashton cigars almost to exclusivity. But, the Ashton Classic line is great and the Churchill is a fantastic stick. It's often my first cigar of the day. Your company rocks. Pricing is always the most competitive along with top notch service. One my favorites, great smoke on the golf course. Cant go wrong with Ashton. Ashtons are one of my absolute favorites to smoke ! Great cigar. A bit pricey but worth it for special occasions. These are great mild cigars! I've had them in several sizes and they never disappoint! WOW What a Cigar!! Smooth and consistent all the way to the nub. Although a bit pricey for my budget I will keep them on hand for those special occasions. Only problem is that those special occasions seem to happen at least once or twice a week. If you’re looking for that mellow smoke get ready for 1-2 hours pure delight. What can I say that hasn't already been said about Ashton? It was a smooth smoke with silky volumes of smoke, nuanced tobacco flavor, and the quality you'd expect from Ashton, Heck, I'd smoke 'em from dusk till dawn if they weren't so pricy. Smooth draw to the end! Great flavor. Ashton Classic Churchill is rated 4.8 out of 5 based on 20 customer ratings.